Here’s another one of the appetizers served at our Beat the Winter Blues Party . I’ve tried a number of recipes for candied nuts over the years, but my favorite is this. (Judging from responses to these sweet and savory bites, I’m not alone.) 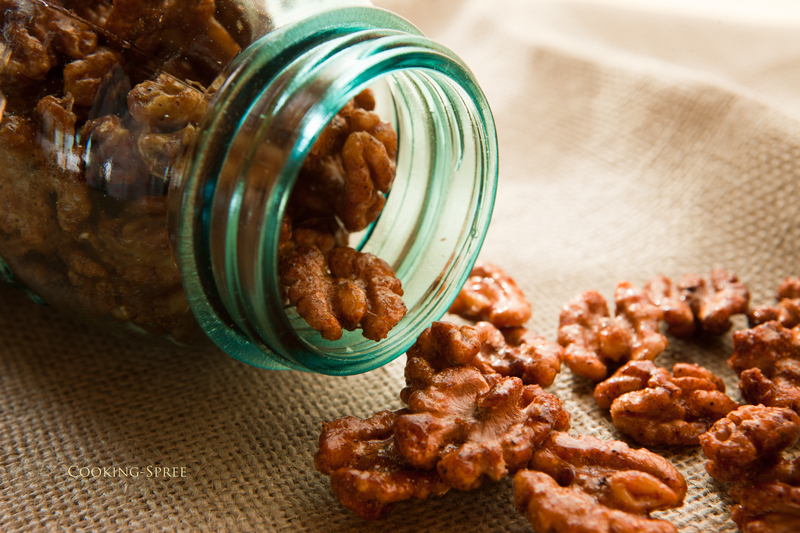 I’ve made it with both pecans and walnuts, and though I love walnuts, pecans definitely have the edge here – something about their sweetness offset by the savory heat of the spices is just right. Spread the nuts in a shallow pan (either a broiler pan or a jelly roll pan will do.) Roast for 8 minutes. Stir to coat well, and then pop them back into the oven to roast another 10 minutes. Serving suggestions: These are absolutely wonderful in a salad. I’ll give a favorite salad to utilize these nuts in an upcoming post. You can chop them up and roll a log of chevre over them and serve with crackers or crusty baguette. Or chopped and scattered over green beans or yams or – . And always as they are, straight from the jar, with nothing but your fingers. This recipe came by way of my dear friend Carolyn, and to her, from another friend. That’s the way it goes with good eats. The original recipe called for corn syrup. I’ve replaced it with brown rice syrup, and not only is their taste improved (yes, hard to believe), but they’re crunchier and healthier too! These are one of our favorite little bites, Elizabeth! These are impossible to stop eating. They have the perfect combination of sweet, spicy, salty, and they have this incorrigible CRUNCH. IT just does it for the mouth. Entirely. Once you start you truly CANNOT stop. And there’s really no good reason to.